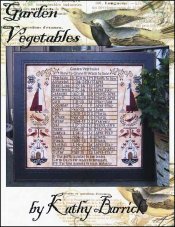 Garden Vegetables [W1145] - $20.00 : Yarn Tree, Your wholesale source for cross stitch supplies. Cross stitch pattern by Kathy Barrick. It's getting to be that time of year...garden time! This design features a chart of the vegetable type, the depth in which to sow the seeds, the days for which the seeds will germinate & the time in weeks to reach maturity. Asparagus, cabbage, carrots, lettuce, etc. are just a few of the vegetables it lists on the chart. Above the chart says, "Garden Vegetables How to Grow & When to Sow." Stitched on the outside of the chart are gardeners, birds, butterflies, a home, etc. This design would be perfect to stitch for the gardener in the family! Stitch count 300 wide x 251 high.